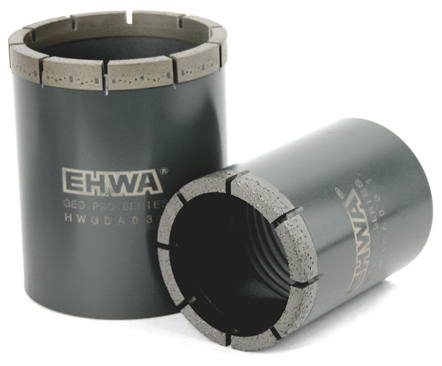 EHWA Diamond Industrial Co. Ltd and General Tool have developed a family of Drilling Tools to achieve maximum performance for all drilling applications. 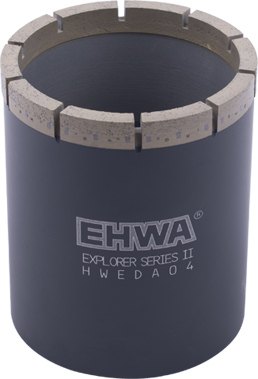 Whether you're performing Exploration, Soil Sampling, Foundation Testing, Highway & Dam Investigation you can expect EHWA Diamond Tools to exceed your drilling and sampling expectations. We offer two grades of bits for all drilling applications. Each bit has a standard diamond depth of 13mm, controlled diamond distribution, a pre-conditioned matrix for reduced break-in time, advanced engineered waterways for enhanced flow, and precise placement of natural diamonds, TC pads, and TSP diamond for ID and OD wear protection. 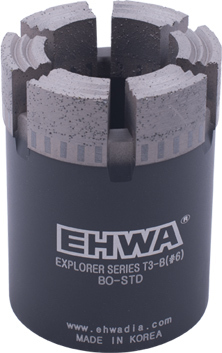 The Explorer Series of Impregnated Core Bits is a unique blend of components and ultra-high-quality diamonds designed for the most demanding drilling applications. Each core bit is manufactured under controlled conditions to ensure consistency and repeatability. 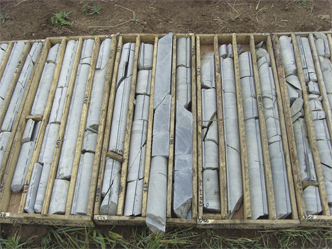 The Explorer Series provides a variety of matrices for all rock formations. with the same precise high-quality standards as the Explorer Series. These bits were developed for the Drilling Contractor that demands consistency of product and performance under the severest ground conditions. Available in four (4) distinct series. We offer two distinct grades of Reaming Shells: Standard and Heavy-Duty. EHWA Reaming Shells are manufactured with a unique patent-pending design. The design facilitates the transition of the cuttings into the waterway area, resulting in longer life and reduced vibration of the drilling tools. Standard Grade Reaming Shells are manufactured with a unique design to facilitate the transition of the cuttings into the waterway area. This design also reduces vibration and utilizes precision set natural diamond for increased abrasion resistance. Heavy-Duty Grade Reaming Shells are manufactured with an ultra-high abrasion-resistant matrix. Additional features include premium-grade natural diamonds, carbide wear pads, and TSPs, precision set for maximum wear. The helical waterways extend along the length of the core to maximize water flow and removal of cuttings. Additional sizes available on request. Casing shoes are available in both Explorer Series and Geo-Pro Series for advancing casing through a wide variety of overburden. 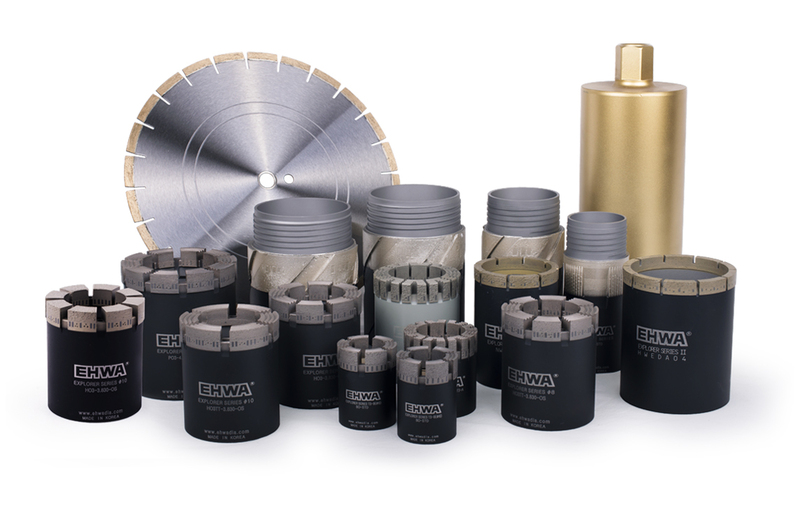 The Explorer Series, available in both standard sizes (DCDMA) and oversize, is manufactured with high-grade diamonds in high concentrations for severe applications. 0.250" diamond depth, select-grade natural diamonds and precision set wear pads guarantee OD and ID gauge protection. The Explorer Oversize Casing Shoe is designed for use with Wire Line Casing Advancers. Available sizes include NW and HW. 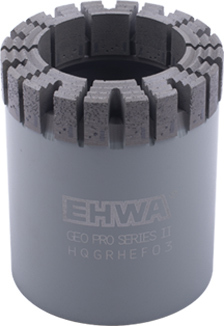 NW OD 3.875" x 2.992"
HW OD 4.875" x 3.975"
The Geo-Pro Series is manufactured with the same high-quality diamonds as the Explorer Series, but is designed for less demanding drilling applications. These casing shoes also come with 0.250" diamond depths, select-grade diamonds and wear pads for OD and ID wear protection.